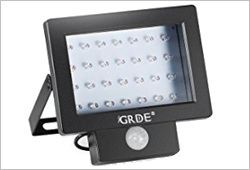 Are you thinking of buying a LED solar flood light? Security of your house or business is of utmost importance for you. You want to have a good night sleep knowing that your house and business is safe from intruders. The best way to stay secure is by installing flood lights. It is a great solution for deterring intruders and wild animals. 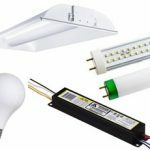 With so many choices available, it gets confusing and complicated choosing a flood light. 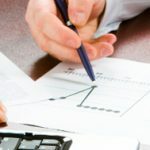 In this article, we have listed some of the best solar flood lights for keeping your home and business safe. The Sunforce 82080 is an ideal choice for lightening up an area. This flood light has an amorphous solar panel along with 15 feet of a wire. It contains 80 LED motion light that produces 900 lumens and has a rechargeable battery. It comes with a mounting kit that enables you to quickly attach the light to a pole. What sets this light apart is that it can resist any weather. You can mount the light at any place and the panel doesn’t need direct sunlight to charge. The motion sensor can detect the motion from 30 feet and range of detection is 180 degrees. It produces a bright light with great coverage area. Read our full review of Sunforce solar lights. The MicroSolar light is a great way to brighten up your house. This light features a natural white light that lightens up the whole area. It is waterproof making it stronger to work in any weather condition. 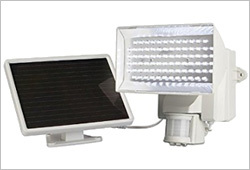 The MicroSolar Flood light has 180 LED light that can produce 1000 lumen. If you often forget to turn on, then this light is perfect for you. It can have the feature of automatically turning on. The light can work from 8 to 12 hours every day. The flood light has a 6000 mAh lithium battery that can last for longer periods of time. 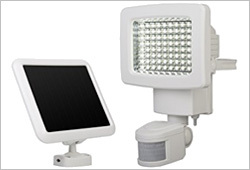 It comes with an aluminum IP65 20w solar panel with adjustable metal brackets. The MicroSolar offers a super bright light and keeps you safe. Another great choice for making your house or business safe is the MAXSA Solar Powered Flood Light. The light has a great motion sensor that can detect motion. This light has 80 LED lights that can produce 330 lumens. 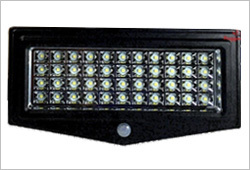 As a result, it can illuminate any size area keeping you safe in the dark. Thanks to its automatic motion detector, you don’t have to worry about turning on the light. The motion sensor turns on automatically after dusk. 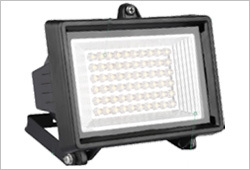 This flood light can be installed quickly and easily. It is waterproof with IP 44 rating making it perfect for any weather condition. 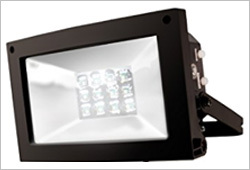 The MAXSA Flood Light is ideal for porches, garages, sheds or lawn. The Findyou Flood Light is another great choice. It has warm white 60 LEDs and 120 lumens output. The angle of the light is 60 degree that covers a wider area. 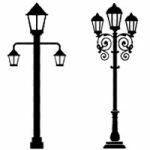 The light will operate throughout the night without fluctuations and dimming. This flood light will keep your house or business lighten up. Most of the lights are unable to work well if they are not full charged. This Findyou LED Solar Flood Light can work great even on a rainy day. Moreover, the light is waterproof and heatproof. The panel of the light is made from top quality plastic. This makes the light strong and durable. A great choice for lighting up your outdoors is the Findyou LED Solar Flood Light. Next option is the MAXSA Innovations Security Spotlight. It has 4 ultra-bright lights that can produce 160 lumens and lit up the area. The lights cover 180-degree area and have adjustable light heads. This means that you can cover 2 areas with the same light at the same time. What sets this light apart from others is its capability of detecting motion from 40 feet away. You can adjust the light settings according to your preference. You can change the time, distance of motion sensor and lux. Having the ability to set the amount of darkness required for activation is a fantastic feature. 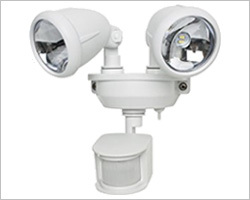 When looking for the best security light for sheds, patios, walkways, carports, MAXSA Innovation is an ideal choice. The MAXSA Solar Powered Flood Light is ideal for security purposes. It has an automatic night activation feature. This means you don’t have to worry about turning on the lights. The light has a photo sensor that activates the light after the sunset. Furthermore, it can stay on for longer hours up to 10 hours. The flood light can stay on for 5 hours on full. It comes with a mounting hardware kit that enables you to easily attach the light to a flagpole. It works great in all weather conditions without any damage and works great. This makes the MAXSA Flood light a great choice. Lastly, the Solar Flood Light is an ideal way to illuminate an area. This light consists of 28 LED lights that produce an extremely bright light. This can be used a landscape light and a lamp as well. When you detach it from the solar panel, you can make it an emergency lamp. The motion sensor of the light works automatically as the light brightens when motion is detected. The solar panel is adjustable, you can tilt it for best sunlight exposure. You can use it at any place from outdoor areas to the garden to shed to the garage. It is waterproof that makes it easy for the light to bear any weather conditions. The Solar Floodlight is perfect for an area where extra light is needed. The High Power Lumen Solar Motion LED Flood Light has a bright light with an output of 1000 lumens. The power it requires is 10 watts, it helps in reducing the energy bill. 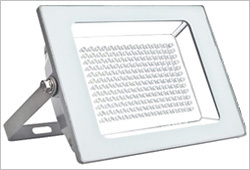 What makes this floodlight special is that it is easy to install. It stays turned on all night keeping the place brighten constantly. The light has a motion and light sensor built-in. The motion sensor work perfectly. 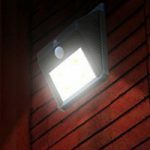 When any motion is detected it can go to full brightness from 10%.You can install the light in your backyard or driveways as it has the ability to brighten up the area. 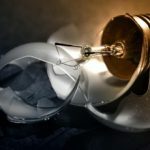 This light has a long battery life that can run for many years. It has 8000 mAh lithium battery that offers improve performance. Whether you want to use for your house or business, it is a great security light. Next choice in the flood lights is the solar powered floodlight by DINHAND. This light has 54 LED lights that are great for producing 400 lumens of brightness. It means it has the ability to brightly lighten up a large area. The light is adjustable as the solar panel and solar spotlight can be adjusted according to the angle of your choice. 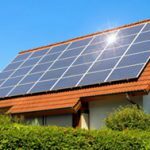 This will means that you can adjust the solar panel to absorb more solar power. Moreover, the light has an automated system that will turn on the light at dusk and shut it off at dawn. They are great for beautifying your house as they can work as a decorative accent light as well. The DINHAND Solar Spotlight is the best way to illuminate and secure your garage shed, road, driveway or garden. 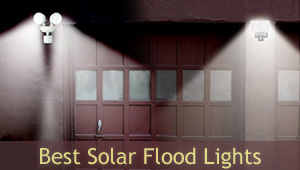 In the end, having a solar flood light is crucial for your safety. You can keep yourself safe and have a peace of mind knowing no intruder can enter without you knowing. 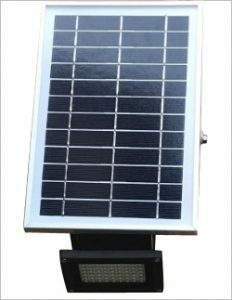 Using solar flood lights doesn’t give you shocks of large electricity bills nor will it have any negative effects on environment.